Its not just about the size. Yes, quality of light is often determined by the size of the light. But size alone isn't enough, you also need to consider distance. A 24" square softbox about 18" from the subject is beautiful. The same 24" softbox move back to 8 feet from the subject isn't so beautiful. Let's look at some of the reasons why. When setting up your lights, you have two creative decisions and one technical. Aperture and light-to-subject distance are your creative choices. How much (or little) depth of field do you want? Select the Aperture for that. What quality of light do you want? Select your light size and distance for that. That leaves you with one more setting. You have to match the power output of the flash to give the proper exposure at your selected aperture. If you want to take the photograph at f/5.6 and your flash meter reads f/8 you have to lower the output of your flash by 1/2 (1 stop). If you move the light back you change the quality of the light. Unacceptable. If you leave the light and stop down, you have a different look and feel to the image. Also not acceptable. So you have to change the power on the flash. At 18" away, the light is large relative to the portrait subject's head. Its light wraps around the subject and gives a nice smooth gradient falloff around the contours of the subject. The light/shadow edge (shadow edge transfer) is soft and smooth. When moved back a few feet from the subject the light is relatively small, it needs to be more powerful, and its light no longer falls off quickly. The light in close is soft and contrasty, with soft shadows. The light far away is hard and flat, with harsh shadows. At first this sounds contradictory. Contrasty with soft shadows? Flat with harsh shadows? In close the light wraps around the subject and falls of smoothly from the highlight to the shadows, providing lights and darks. Yet there is little shadow from the nose or eyebrow ridge. The smaller light, further away, gives a more even (flat) light across the subjet (less contrast), but is not close/large enough to wrap around contours like the nose, giving dark shadows on the opposite side from the light. Now that the size/distance is coming clear we need to think about how much light there is. What do you set the power level to on your flash? This is something I don't think a lot of photographers take into consideration. Its main effect will be in specular highlights, such as oils on the skin or the catchlights in the eyes. Specular highlights are not subject to the inverse square law, which says that when you double the distance between the light and subject the subject receives 1/4 the light (the light has to cover an area 4 times the original, not 2). But we're not talking about overall area here (the diffuse reflection). We're talking about the mirror-like reflection of the light source. Those stay the same no matter the light to subject distance. In an extreme example, we can look at a mirror and a light. Photograph the reflection of the light in the mirror with the light 12" away. Then photograph the same light reflection in the mirror, but from 10 feet away. The bright specular reflection of the light will be the same brightness. The rest of the scene will be much darker. But the light in the mirror remains the same. So, you ask, why do we bring the light in close? Because in close we can lower the power to get the same exposure. Lowering the power lowers the light output. So up close that catchlight in the eye or the highlights on the skin are lessened. Additionally, because the light is in close and large, these reflections get spread out and even out. Instead of a bright hotspot on the tip of the nose, there is a nice even glow across the entire face. In the above samples the light to subject distance was changed, the power on the flash remained constant, and the aperture was changed* to maintain the same exposure. Pay particular attention to the mannequin's right cheek, the tip of its nose, and the lips. In the first image, with the light further away (smaller) you see bright highlights in these spots. 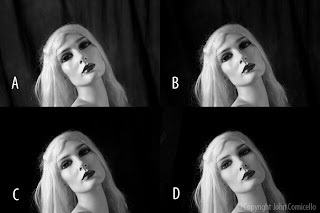 As you move to images b, c, and d, the light was moved closer, becoming larger. In doing so you will notice that the highlights spread out more and the overall look is softer. This is something to consider when purchasing studio strobes. Too often the first thing a new photographer asks is "how powerful is the light?" Should I get 600 watt seconds? 1200? 2400? More? In some situations, a lot of power is necessary. So it is a good question. But the question I usually find myself asking when shopping for lights is "how low can I set the power?" and "what affect on color and flash duration does this have?" The more expensive flash units will usually offer better consistency (the flash color doesn't change when power levels change) and will offer a wider range of power settings. Some less expensive units may just offer a 2- or 3-position rocker switch (full, 1/2, 1/4). While more expensive units may have a variable slider or dial so you have more control to get just the power level you want. Bringing the light in close also helps pop the subject out from the background. It also lets you light the background independently of the subject. Being in close, the light falls of quickly (go back to inverse square). The light falling on the subject doesn't have enough power to reach the background. The background stays dark so you can light it separately to give the scene contrast that you desire. You can also use other controls on the background (color gels, a spot light, grids, etc.). Going back to the example image above, you see how the background is lit by the single light source in example A. But when moved in close, as in example C, the background has gone completely black. If you want, you can light the background completely separately now with a spot, color gels, etc. As you move the light further away from the subject you have to raise the power to maintain the desired aperture and the light spreads out more. Where in close the light only fell on the subjects head and shoulders, moved back it covers their entire body and also spills onto the floor and background giving a flatter, blander image. For this reason, a larger light further away is not the same, even though the size relationship to the subject might be the same. A 24" square light at 24" away from the subject may have a similar light quality to a 48" square light 48" away on the subject, but the rest of the scene will be noticeably different. The light further away will produce an overall "flatter" image with the light spilling onto the background and periphery of the subject. *Earlier, I mentioned maintaining aperture for creative control over depth of field. The two examples below are taken at the same aperture, but this time the lamp power was increased when it was moved further away to maintain the exposure. Note the same issues listed above. When far away, there are hightlights and shadows on the face and the background is lit up. In close the surface is smoothed and the background has gone to black. Thank you for the detailed explanation with clear examples. Thank you for the work you are doing, thank you for this blog!